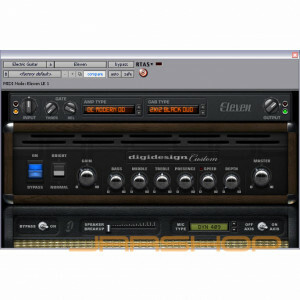 Digidesign® Eleven™ is a powerful TDM/RTAS®/AudioSuite™ plug-in that sets a new standard for recording and live guitar amp sound. Eleven allows you to achieve highly realistic, jaw-dropping guitar tones based on the world’s most coveted vintage and modern tube amps, speaker cabinets, and mics — all right in your Pro Tools®, Avid®, or VENUE rig. Developed using an innovative new amp modeling technique, Eleven gives you instant access to an amazing collection of sought-after sounds based on classic Fender®, VOX®, Marshall®, Mesa/Boogie®, and Soldano amplifiers. * Simply call up a preset to immediately re-create a hit-making guitar tone, or design your own signature sound by mixing and matching amps, speaker cabinets, and mic models — all captured at their best in a world-class studio.